UltraCane ....putting the world at your fingertips. The award winning PATENT PROTECTED UltraCane is the most advanced primary mobility aid used by people who are blind or visually impaired. The UltraCane gives you more information about your environment and enables you to make decisions much more quickly, allowing you to move around more safely, confidently and effectively; putting you in full control. 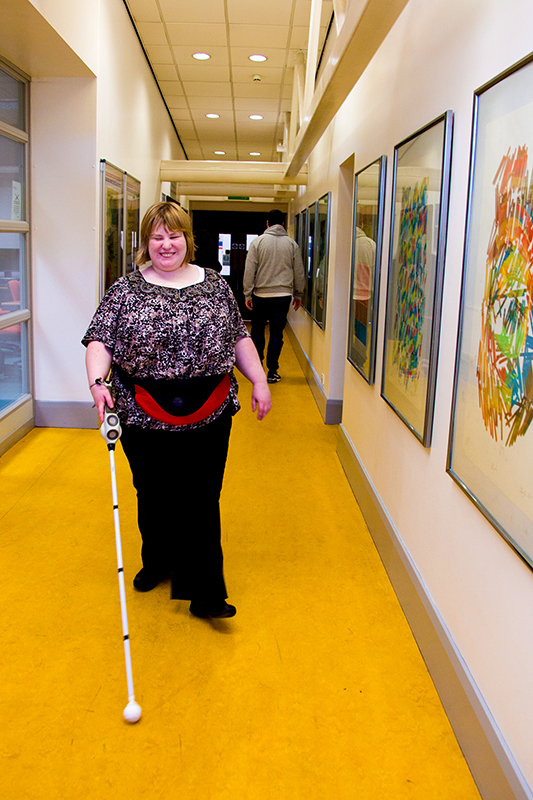 Do you currently use a traditional long white cane? Do you find that no matter how efficient you may be using a long cane, you still come into contact with obstacles and hazards in particular at chest and head height? Or perhaps your long cane becomes caught up in chairs, tables, signage and other 'street furniture' ? By using the UltraCane, obstacles can be detected early so that you can navigate around them safely, including avoiding head and chest height obstacles. The UltraCane detects obstacles because it is equipped with a dual-range, narrowbeam ultrasound system that provides a 100% hazard protection envelope in front of and, uniquely, forward of the head and chest of the user. Two ultrasound transducers provide range data on the closest potential hazards, such as street furniture, plants, people, road signs, and over-hanging branches. This makes the UltraCane equally usable on the street as in interior spaces. The feedback about obstacles is delivered through two small vibrating buttons mounted in the handle of the UltraCane. To find out how UltraCane can help you, read About The UltraCane.